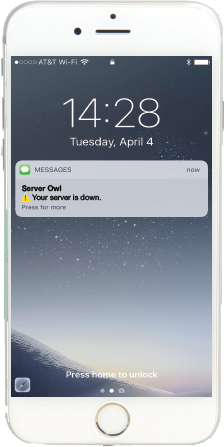 With ServerOwl, you will receive real-time notifications and SMS messages the moment your server becomes unavailable. You can even set the notification to go straight to your developer! This way, you'll be able to tackle problems immediately and avoid losing out on sales and traffic that you're likely paying for. The real-time notifications feature comes with a paid plan with ServerOwl. Check out details and pricing below.